"Solitaire"/"Love Me For What I Am"
My favorite of all- beautifully artistic! Karen has never sounded better! One of their best albums but not my personal favourite. For me it suffers a little from carrying too many ballads and while the Aurora/Eventide bookends are a nice hark back to 'A Song For You', they're too similar and short to qualify as proper album tracks in my opinion. I like this one. I think it's their best sonically for sure. Beautifully recorded and mixed. The bookends are a nice addition though I agree with Stephen in that I would rather have had actual tunes instead. "Only Yesterday" from a vocal perspective is just great. Karen's lower register comes into play here and the backgrounds are sublime. I also like the extra percussive touches in the b-sections and choruses. Busy little tune but very hooky too. "Desperado" is one I can do without. It's a plodding thing that Karen, although game and seemingly totally into it, brings nothing to, honestly. "Please Mr. Postman" is absolutely wretched. I totally get why Gerhardt didn't like it. The Marvelettes version is definitive and it (along with all Motown stuff from that era) had an energy that Richard's arrangement and the band playing it couldn't even approach. Karen's double-tracked lead is precise but, because she has to double herself, the precision takes all the fun out of the tune. The vocal arrangement isn't even very good. Again, no energy. This tune only works if you have fun with it. Carpenters tried to make it a precision exercise and failed miserably. How it was a hit at all is entirely beyond me. This is, without question, they're biggest misstep - far more so than even "Goofus". "I Can Dream Can't I" is a stellar Karen vocal. Were she confronted with the kinds of records Rod Stewart recently made (all those Great American Songbook things he was horrible at but that generated a lot of money), she'd have sailed through them. She took this tune and did wonders with it. The arrangement is spot on. Most impressive are the backgrounds. Richard's vocal arrangement is straight out of the '40's - totally different from Carpenters harmonies. Sue, Jerry, Allan, & Gene did a marvelous job rendering them too. Great choice of song and exquisite performance. "Solitaire" isn't a bad choice at all. By this time, we'd already had one plodding ballad ("Desperado") but this one was far better suited to Karen. The way she caresses the word "again" in the choruses sells me on the tune all by itself. I don't love the tune but I think it's pretty decent and all involved did a great job on it. "Happy" is just that: Happy. This one's a lot of fun. The handclaps in the chorus certainly help to that end but even just taken as a melody, it's fun. Tony's music and melody are really nice and Karen handles it all beautifully. I also like the lyric (written with Diane Rubin) and the way it rides the melody. Bettis had a real gift for that and it's on display here. I also really like the synthesizer at the end. What a great idea. Nicely done all the way around. "I'm Caught Between (Goodbye and I Love You)" is another one I can do without. It just doesn't do anything for me. The ideas this one uses have been used better on other tunes. "Love Me For What I Am" is the best ballad here by a long shot. Very nice tune and yet another winner of a lyric by Pascale (with revisions by Bettis). Karen goes all in here and her voice is right in your lap the whole time. Beautifully recorded. When she hits the beginning of the second verse ("If what you want..."), Karen's voice can get no closer to the listener. The vocal arrangement is, yet again, just stellar, though I could have done without the phasing effect on Karen's voice on the chorus. Not sure why that was done. The ending stack ("so let me go...") is just spine-tingling stuff and Karen's "I must be free" is a perfect way to end the tune. Richard's arranging instincts paid off high dividends on this tune. In my opinion, the single featuring it as the b-side to "Solitaire" should have been instantly flipped. How it wasn't is entirely beyond me. Overall, a very nice album but not a perfect one. Still, it showed a definite maturity in sound - especially sonically. MFSL should get their hands on this one - though I can't imagine it sounding better than what I already have. It's absolutely an audiophile release if they ever did one. Oh yeah, and after all the cover art mishaps that paired Karen and Richard as husband and wife rather than as brother and sister, this one finally gets it right. Karen is just stunning and the LP package is beautifully done. Jamesj75, Walkinat9 and GaryAlan like this. ...is like the devil and the deep blue seaaaaa OMG. K&R's production is impeccable. Karen's voice a treasured triumph. As time rolls along this lp has become my fave spin. 1st listen kinda, well really slow but this listener was/is nonetheless transported. At audio equipment purchase times this is the album that accompanies me for sound tests. To display CarpenterS studio perfection, cuts from this record are shared with the new convert. Sentimentally, this offering signifies the beginning of the end. I don't mean chart positions although it does represent the last of the top hits. Literally, given the info available we deem this period as Karen's initial decent into the abyss which would eventually rob her of life. To me bittersweet really, almost painfully so. HORIZON gets top vote from this Oregon locale! Jamesj75, A&M Retro and GaryAlan like this. Another thing...can you believe that the #1 charting POSTMAN will soon be 40? Yes, 4-0. An eye-opener for me. Truly one of the best benefits of being 50 (I know, who knew?) is that I was there for the hey-day. I'm grateful to have 3 concerts, purchases of singles and lp's on actual release dates, fan club news and memorabilia all under my belt. Watching their meteoric rise to worldwide fame, respect and Grammy recognition 3x's over was a thrill. The anticipation of Make Your Own Kind of Music so long ago. Other tv stints and features all first hand. Sadly tho, w/that came my witnessing a true horror. Anyways on a lighter note, 40 years about to hit. The equivalent of our parents having listened to something from '34 in 1974! And I can't think of any other album cut in Richard and Karen's catalog that was more deserving of being a single than "Happy." How that one got overlooked as a single is absolutely beyond me. Just a wildly underrated song. Ugh! Desperado is my favorite song on the whole album. I just love Karen's version! I do agree about "Love Me For What I Am" being superb though. Her reading of that is spot on. Jarred and A&M Retro like this. The video that surfaced recently of Karen wearing the same shirt she wears on the album cover was amazing to see. She looks so good. It's like seeing her in person at the same time the album cover photo shoot was taken. It was a rare video to see her at this same time period. She looks amazing, if only she knew that. LOVE Desperado! Should have been a single! A&M Retro and RainyDays like this. 5 stars from me. Up there with AS4U and Made in America for me. . .I know, I know, but I love MIA. As a Brit I'm also proud this album got to the top spot in the UK charts for 5 weeks (while singles 69-73 continued to bubble in the top 20 2 years after its release). The artwork, packaging, and song selection is so classy and lush that its aged beautifully. "Postman" does feel out of place next to the rest of the tracks (though its a great song on its own), but it doesn't detract from the brilliance. I love Desperado and it should have been a single in place of "Soltaire", with "Happy" as the third single. I miss the "group" sound, but Karen sounds so clean and crisp here. Her vocals were at their peak here in 1975. It's not a crowd pleasing album, like say A Song For You or Now & Then might be, it's meloncholy and downbeat but sadness never sounded so beautiful. And the cover reflects this mood. Though I would have loved for the new ANTHOLOGY picture to have been Horizon's cover (but I love the one they used too). Carl, CraigGA, Must Hear This Album and 1 other person like this. Greg, From This Moment On and BarryT60 like this. Very interesting ... but there is another side to this one too! Richard himself described the album as "draggy", and I must say, following the likes of "A Song For You" and "Now and Then", I did wonder if they were running out of ideas. I bought this as soon as it was available - and of all the tracks - I thought "Happy" might be a sign post for the future. Tony Peluso writing, Karen plus acoustic guitar, a bit of synthesiser ..
Drummer Hal Blaine says in his autobiography chapter (never published other than on the net) that the assumption of full control by the act was in his experience very often the beginning of the end. Endless hours poured in for sure, but somehow a tendency to lose sight of the big picture. "Its Going to take some time". She also tackles tricky melodies like "Goodbye to Love" and "A Song for You". The logical bed mate for this album is "A Kind of Hush". 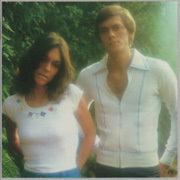 These two albums represented a big dip in sales for the Carpenters. I can see that newer fans looking backwards may find more in this album than I did when it was released, but to me it sounds like the beginning of the downward spiral - little was I to know that it was exactly that. I might add that "Only Yesterday" and "Please Mr Postman" were the start of what I think of as the Castenets era. Not truly up tempo at all , and this might have led to the adjective of Richard's .. draggy. I have wondered if the success of Please Mr Postman sent the wrong signal to the group and their backers. I celebrated the one-off and hoped we'd return to singles of the class of the 6 high-charting songs on "A Song For You". And in terms of slow ballads - I find nothing on "Horizon" as impressive as "I Can't Make Music" from the previous album. ...to me it sounds like the beginning of the downward spiral - little was I to know that it was exactly that. I have wondered if the success of Please Mr Postman sent the wrong signal to the group and their backers. Two excellent points George, and I agree with both. HORIZON seemed draggy to me too, but the real clue to me of the "beginning of the end" was the use of other voices on "I Can Dream, Can't I." Now at the time, I hadn't made the connection that the chorus of backing singers was a hallmark of the big band era and that the song was supposed to evoke that kind of sound. Still, I thought that the one thing I really gravitated to with Carpenters music was their overdubbing backing vocals. This felt like a let-down to me. And the success of "Please Mr. Postman", after they'd done the Oldies Medley thing, surely must have told them that that was the road to go down, and they did. Had they stopped the castanet oldies at that point, things might have gone smoother, but we were still to endure the likes of "There's A Kind Of Hush", "Breaking Up Is Hard To Do" and "BEechwood 4-5789". One wonders what fabulous unknown songs might have been done instead of resurrecting these. I agree with the "draggy feel", there are just too many ballads on the album, if it were not for Happy and Postman it would be even a darker album. I believe even though it may be draggy at times....just the way Karen sounds on this album out weights all of that in my opinion. When I listen to Horizon as an individual album it leaves me with a feeling I don't get from any other Carpenters album. I have said it before...I don't know if it was the studio, the particular mic she was using or what but there is a richness, smokey tone that leaves me with goosebumps on particular tracks. It's funny how we all enjoy tracks more than others....for me (I'm Caught Between) Goodbye And I Love You and Solitaire are 2 standout tracks on this album...when listening to the album as a whole...I usually hit repeat on those multiple times...I just can't get enough of them. I agree Chris, karen sounds just so rich on this album. I wonder if , as she said herself , that her voice got more silky when she was about 25 years old, and she much preferred it. Maybe she wasn't ill enough for it to affect her voice at all in '75 and if she hadn't of got more ill, it would have stayed like that?? Although the album Horizon has many ballads, I love the production. Stereo drums, unique sounds and Karen more upfront than ever. So different than it's predecessor, yet so marvelous. I do like and appreciate the lushness, the production, and the way HORIZON was recorded. It just didn't thrill me the way earlier Carpenters albums did. Oh I really liked "Only Yesterday" as a single - still do - it's one of my favorite tracks of theirs. I love the bookending too, but it seemed to cut into the number of real song tracks. Side One of the album was the better of the two, I thought. It had the varying tempos and styles that I liked with Carpenters albums. It's Side Two that really brings things to a halt for me. "Happy" is a decent tune, but there's something missing about it. And the rest of the side just sounded kind of uninteresting, leaving me with a "Is that all there is?" question. So the production was top-notch - it's the material in general that let me down. Song4uman and george_b like this. Like you Harry, I accept that the production of "Horizon" was of a very good standard, and indeed it should have been because so many hours of production were consumed. But like David Crosby in his biography says - there is no amount of production wizardry that can outweigh the value of the material itself. When I think of "Solitaire" I think immediately of Andy Williams and the songwriter Neil Sedaka. Frankly I don't think Karen had much more to add to that one. Even "Desperado" was already well known, being an original for the Eagles (of all bands) - I agree with Stephen above when he says. "It's a plodding thing that Karen, although game and seemingly totally into it, brings nothing to, honestly." Equally applicable to "Solitaire". Incidentally, "There's a Kind of Hush" is to me a classic Herman's Hermits type of song from the old music hall thing Peter had going - not a castenets number. Karen fared much better with songs by Bacharach/David, Leon Russell, Paul Williams, etc. Great songs with indifferent original performances could be lifted to a new level, especially if some syncopation was involved. Harry puts it so well. All the previous albums thrilled big fans like myself, there was always something strongly creative and deeply musical there. It is not enough for me to have a nice song from someone like the Carpenters - I want to hear them take the song somewhere. They did that with ALL the oldies on "Now and Then", so what happened? I will always love the group, the sound but I am not one to get geeky about popular music and entertainment, which is what this is/was. where is this video? Thx! My only beef is that it was too short. Another couple songs would have clinched it... and frankly, I don't even care if they'd have been one up tempo and another ballad... I liked Karen best on ballads... so - the more the merrier in my opinion. Only Yesterday, wow – the first time I heard this on the radio was - - love at first listen. It was and remains one of my favorites of the post “The Singles 1969-1973” era. I liked Desperado – and actually have grown to love it as time has marched on. While I agree that it was a known song at the time, by now, it’s one of those that we are lucky to have in our arsenal of power ballads by the duo. Strong production values – and a knock-out vocal. Love Me For What I Am – to me is a beautifully arranged song… one that doesn’t resonate lyrically, as it gets a little whiney, but a nice listen, just-the-same.. Since I have an album with two of my top 5, and production values that really feature Karen’s voice at the top of her game, plus a number one single… and beautiful cover photography… I give this one two thumbs up. I agree on all counts! I love 'Aurora' and 'Eventide'....they are just as much 'songs' in my opinion as anything else on the album. I've used 'Aurora' as an opener for many self-made Carpenters compilations through the years. It's classy and atmospheric. 'Desperado', to me, has it all. Karen never belted it out more than she does on this tune. Reminds me a bit of 'Eve' in the power she displays in her vocals. It was a whole new approach for Carpenters that they should have investigated more. I also love 'Solitaire', but it is a very slow, brooding tune, and I also could understand why it didn't go Top 10. It wasn't single smash material. But Karen's vocal and Richard's arrangement are amazing. 'Only Yesterday' and 'Happy' are two all-time favorites of mine, too. I still remember being so pumped buying the single, and realizing there were TWO NEW SONGS all on one 45 prior to the album's release! That only happened once, and never again. 'Happy' would have made a great choice as an A-side. Never could figure that one out. BarryT60 and song4u like this. on my notes above, I was referring to I Can Dream Can't I on the 5th line up. Just realized I left out the name of the song!